Looking for an easy to match tie for a wide range of shirts and suits? Want tie tie that works for job interviews as it does as an accessory to wear to a friend's wedding? 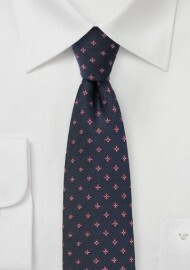 Then this matte woven tie in navy blue would be a great choice. The blue background is decorated with woven geometric florals in light blue and white. While great for all your shirts, we like it the most with a light to medium blue solid colored or herringbone shirt.